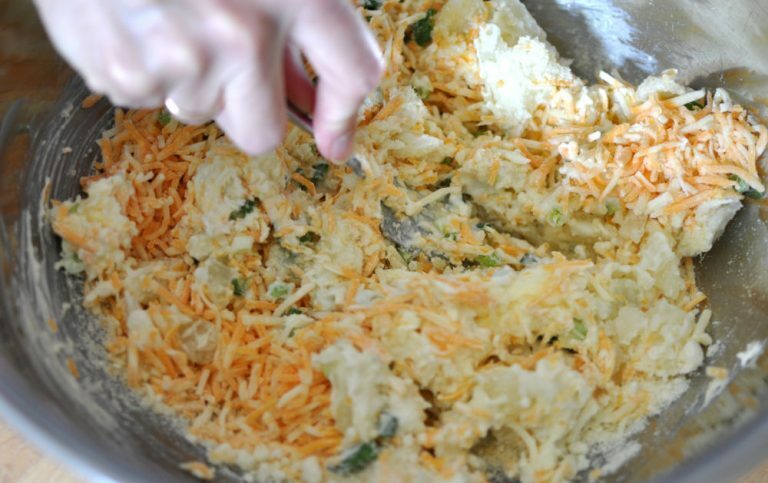 Every Easter I make Julie’s Stuffed Baked Potatoes, and the rest of my family brings the ham, vegetables, desserts, appetizers, etc. I shopped today for all the ingredients, and thought I would repost the recipe for those of you who haven’t tried these yet. They are moanworthy. 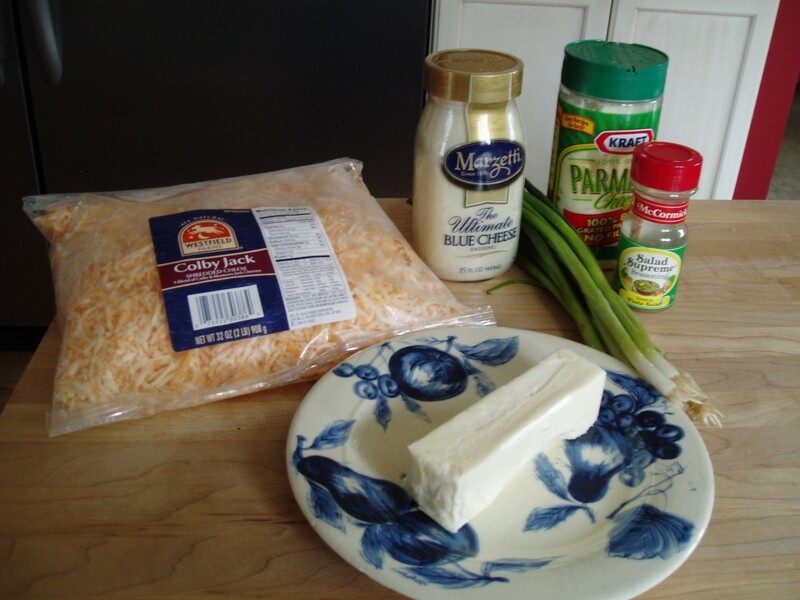 You will need large baking potatoes, cheese (I often use colbyjack but you could use cheddar, jack, pepper jack, whatever), blue cheese dressing, parmesan cheese, butter, green onions, and McCormick Salad Supreme. 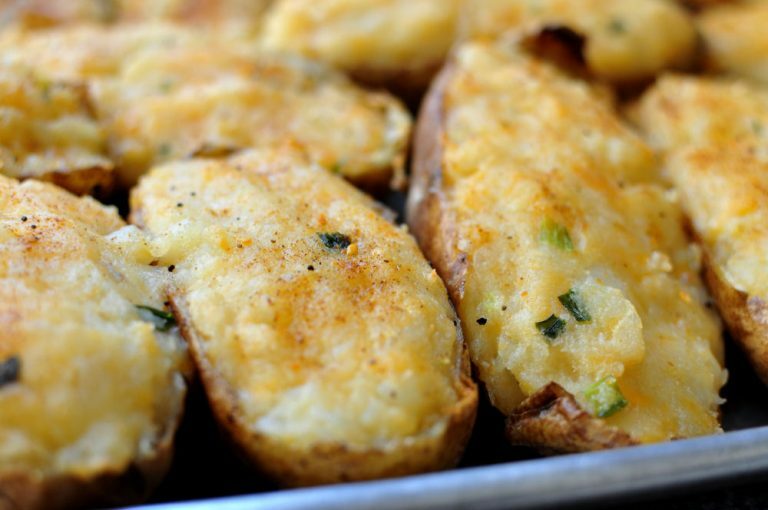 First, bake your potatoes. I have two ovens, which comes in very handy on holidays. I baked my large baking potatoes in the smaller upper oven (you can see the pizza stone I store there) while the not-so-ho-hum ham was cooking in the larger oven below. 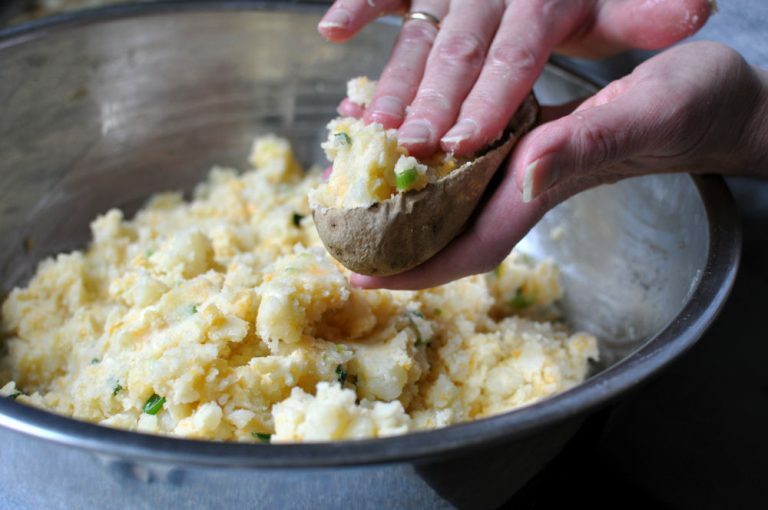 While your potatoes are baking, take some green onions and chop them up pretty fine. I used about 4-5 onions. One nice thing about this recipe is that you can just put in as much or as little of everything as you like. Experiment with the flavors and adjust as you go. You’ll see how I did that later. 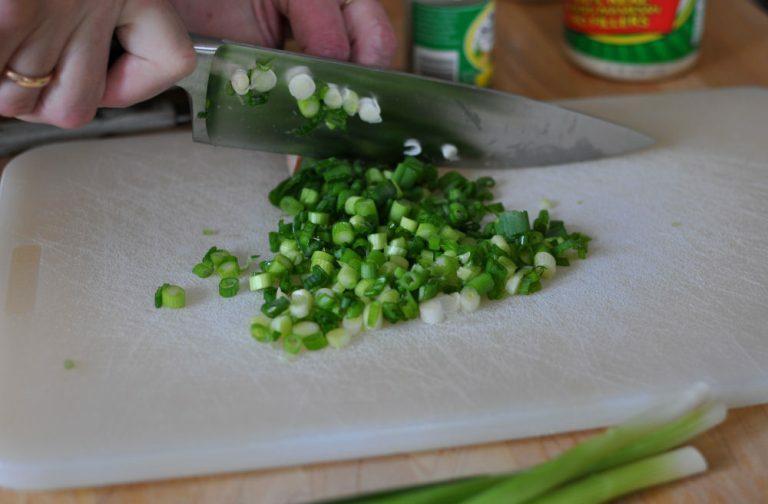 I use the green and the white of the green onions. Some people call them scallions but I never have. Maybe one of you can tell us why they’re called scallions – is it a regional thing? I don’t care as much for that name because it reminds me of the word scallywag, and the word scallywag reminds me of a certain person that I would prefer not to be reminded about when I’m making Stuffed Baked Potatoes. This next part is important. 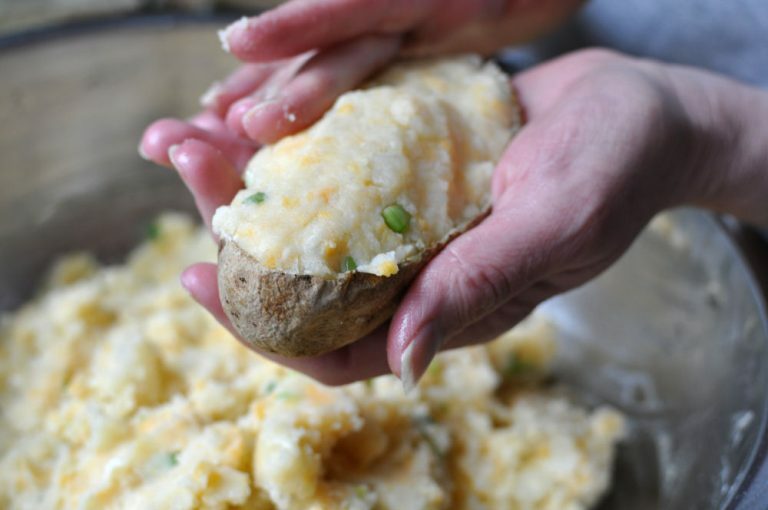 Have all your ingredients ready in a bowl while your potatoes are baking, because it’s the heat of the baked potatoes that will cause everything to melt together nicely. 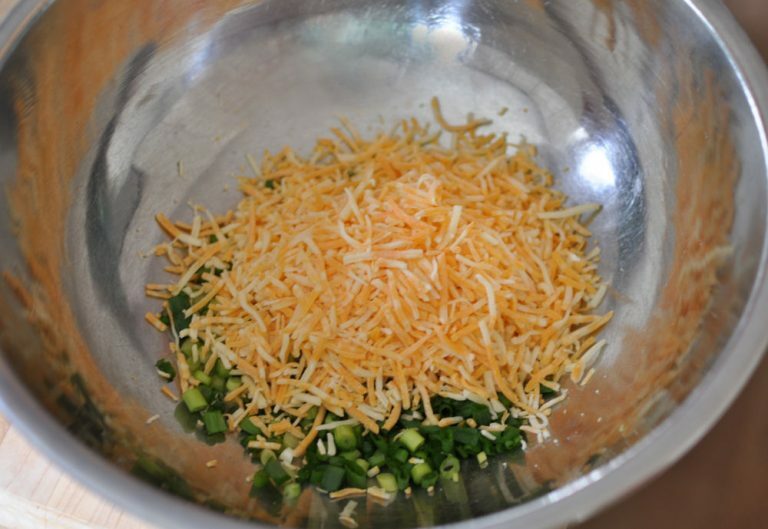 Below you can see that I tossed in about two heaping cups of grated colbyjack cheese. We were feeding a lot of people on Easter. 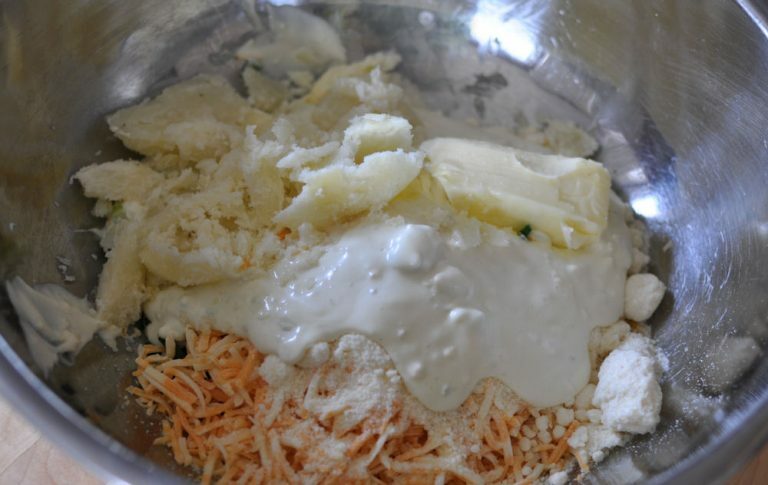 Next, I added about 3/4 cup of blue cheese dressing and about 3/4 cup of Parmesan cheese. You could use less or more of either ingredient. 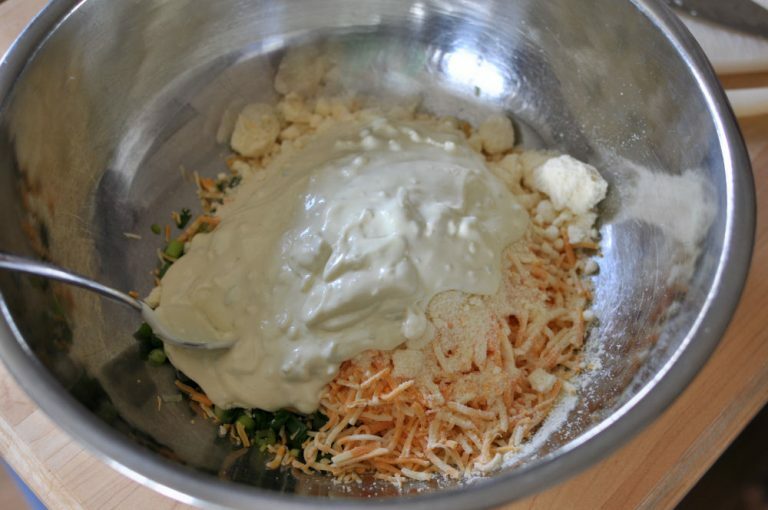 I happen to love blue cheese dressing so I put in a lot. Maybe it was even closer to a cup of blue cheese dressing. If you look closely now, you can see that the first potato is in there (I’ll get to that in a minute) and I also threw in about 3/4 of a stick of butter. This is Easter, so don’t worry about fat grams. You could worry about that the day after Easter. Well, don’t worry about things anyway. Now I just started to mash things together a little bit. My potatoes were done baking. I smooshed things around with the fork while my daughter took photos with her very nice camera that she uses for her amazing photography business. 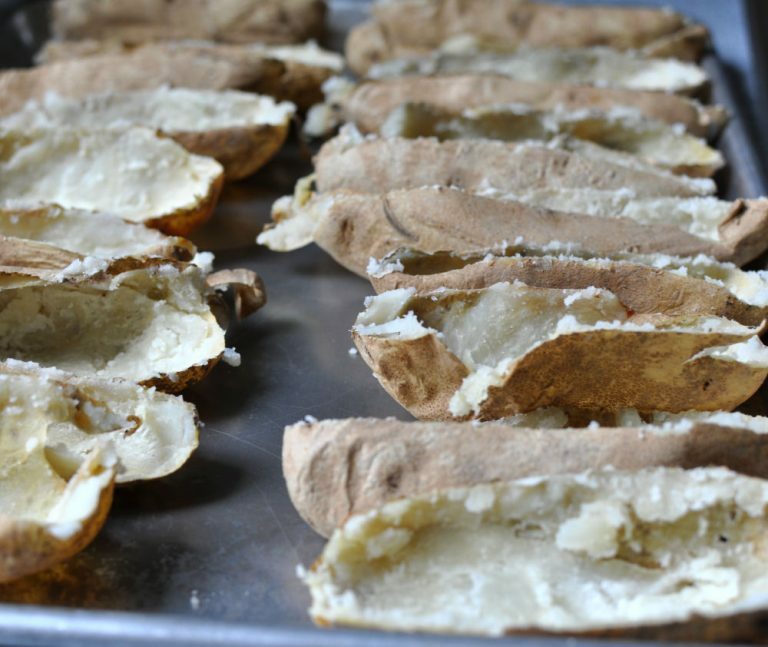 When the potatoes are done, I take them out one by one, hold them in an oven mitted hand, and gently cut them in half, taking care not to ruin my beautiful oven mitts. 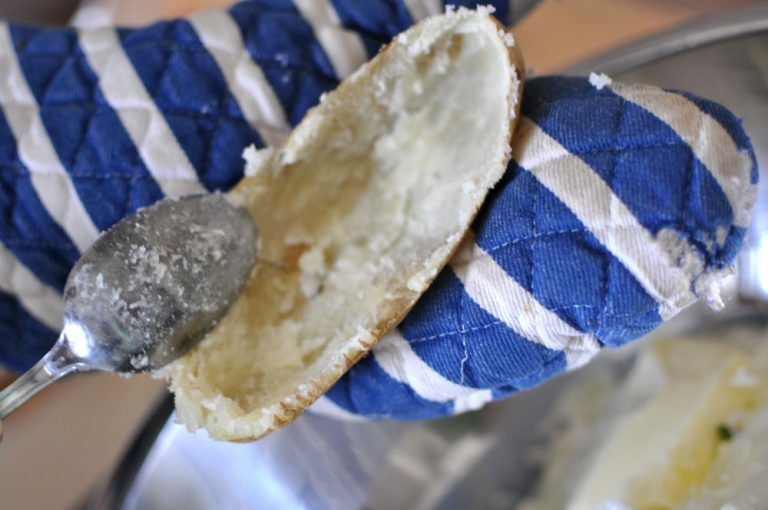 I take a large spoon, and while cradling the hot potato in my mitt (please try not to notice the holes in my mitt) I gently scoop out the very hot potato innards. I try not to ruin the skin, but sometimes it happens. See how there’s very little left of the innards? Then you can just set these forlorn looking skins on a baking sheet. And they will look like this. Sort of like sad spudwaifs. Because I have made this recipe hundreds of times, I can tell by looking if it’s what we’ll like. I could see after smooshing and mashing that for the number of people we were going to feed, we needed to add another handful of cheese. 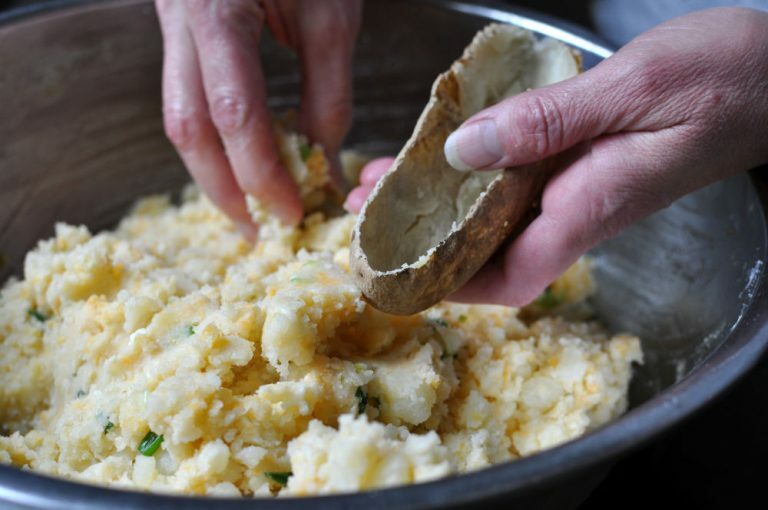 Just stir and mash with a fork until the hot potato innards have melted most of everything, and until you don’t have any clumps of unmashed potato left. If you do, that’s okay though. Potato clods never hurt anyone. 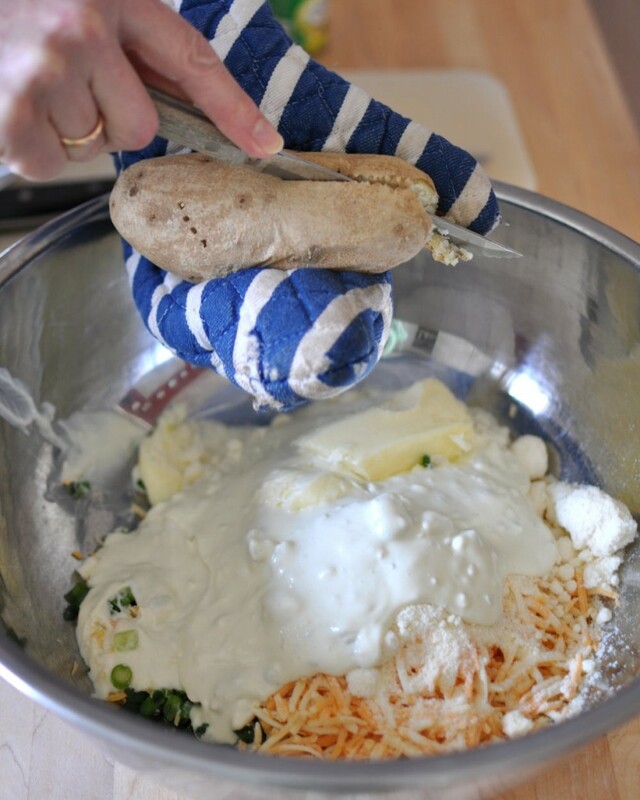 Now you can take your holey mitts off and start to fill the empty potato skins. The mixture will be cooled off enough to use your hands. 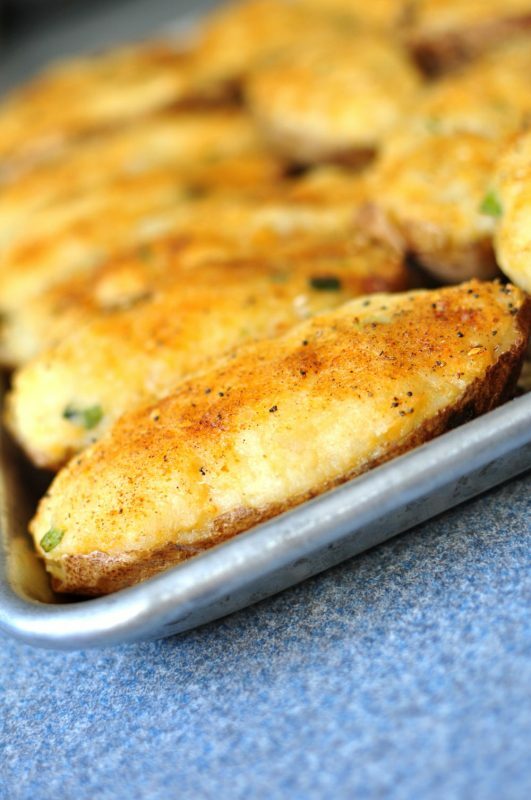 Grab a few globs of cheesy goodness and press them into the potato skins. Make sure you delicately lift your little finger as you do it, as a polite Englishwoman would do when sipping her afternoon tea. I’m not sure why this important, but just take my word for it. 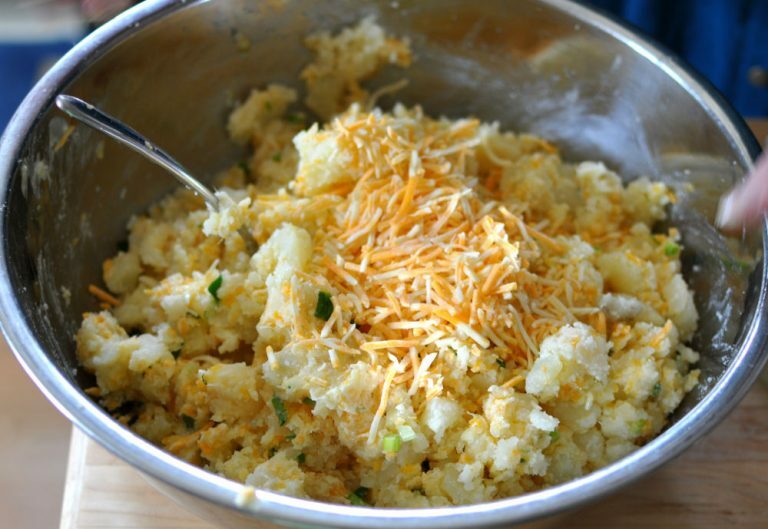 Not too much – just a little mound of the potato/cheese mixture will do. 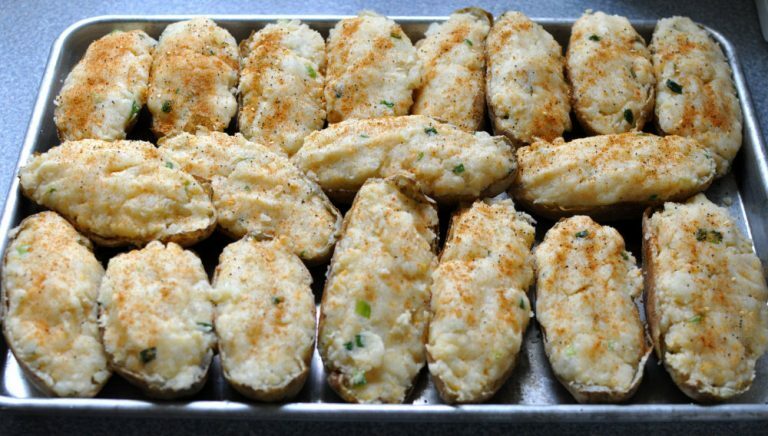 Here are all the potato halves, stuffed with that delicious cheesy mixture, sprinkled conservatively with the Salad Supreme, and lined up ready to go back into the oven. If you lean to the left politically, then you could be a liberal sprinkler. For the most part I’m a conservative sprinkler. I then bake them at about 375 or 400 degrees (I can’t remember which) until they get hot all the way through, maybe about fifteen minutes or so. 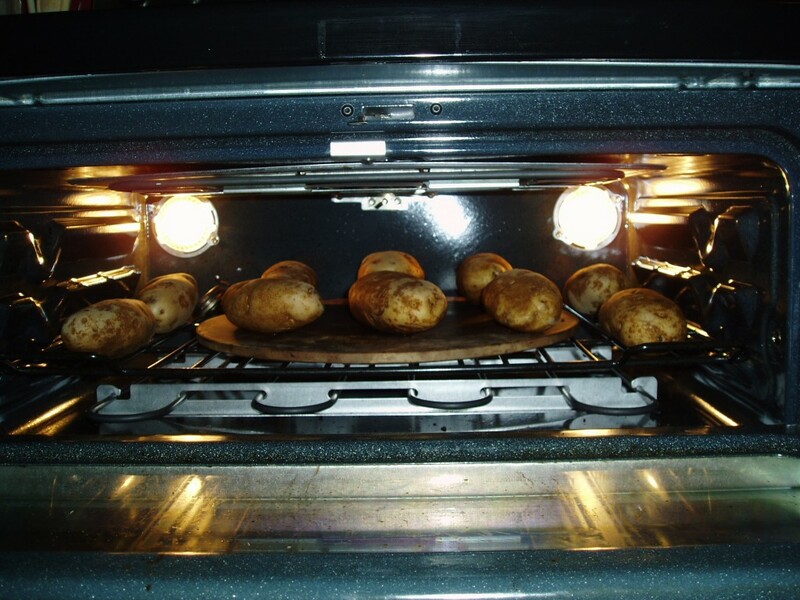 Then about five minutes before I’m ready to serve my Stuffed Baked Potatoes, I turn on the broiler and begin to watch them carefully. I want them to get just a little bit darker and start to bubble. You could let them get browner than this if you like – just keep an eye on them. These also freeze really well, reheat really well, taste good the next day for leftovers, and some people even like them packed in their lunches. 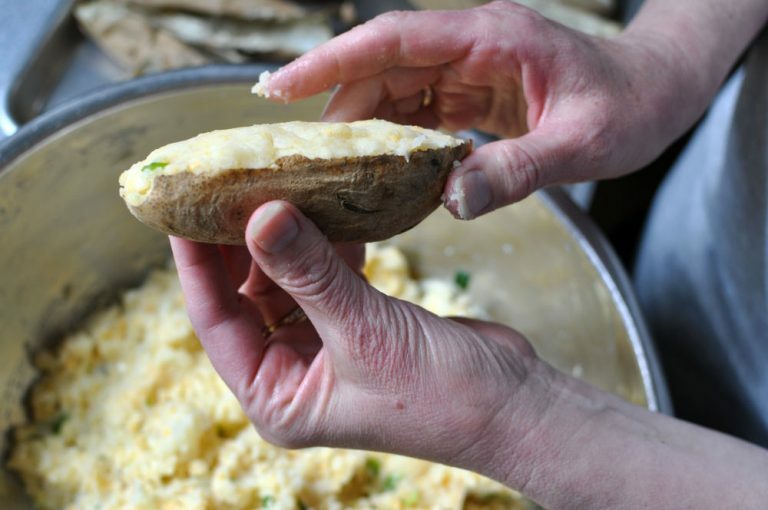 How do you fix your Stuffed Baked Potatoes? Sharon and I were talking about all the variations that would be good with these – bacon bits, broccoli, rosemary, and a few other things I can’t remember now. 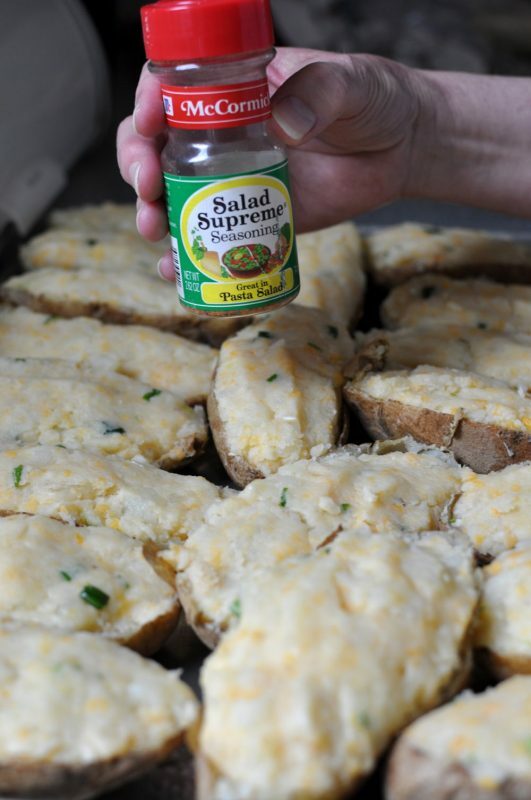 What else would you add to your Stuffed Baked Potatoes?